General William Tecumseh Sherman famously said "War is cruelty, and you cannot refine it." This statement has contributed to his mythic status as a grim-visaged Civil War character who embodied implacable war. Utilizing unique and highly successful maneuvering techniques, Sherman was an original, decisive, and efficient leader. Rising steadily through the ranks during the Civil War, Sherman quickly became Ulysses S. Grant's right hand man. He went on to lead the Union capture of Atlanta, a major victory that contributed to Lincoln's reelection during a tough phase of the war. Legend has him burning a sixty-mile-wide swath of desolation across the South, but while he held the harsh view that the Southern people must feel the pain of the war if it were ever to end, he also showed courtesy and restraint to those Southerners he encountered and strictly limited the destruction to strategic targets. An integral component to the North's success, Sherman was directed and single-minded in his pursuit of Union victory and a re-united country. 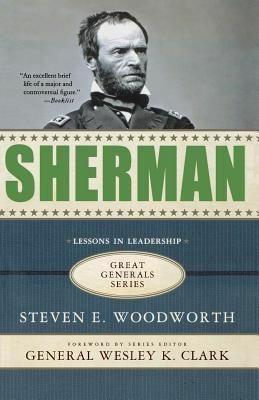 Acclaimed Civil War historian Steven E. Woodworth delivers a nuanced, insightful portrait of General Sherman, as a man who shied away from the spotlight and only wanted the war to end as quickly as possible.